Pretzel Logic's Market Charts and Analysis: Will the Fed Kick-off an Equities Correction Next Week? Will the Fed Kick-off an Equities Correction Next Week? While it seems like this rally leg will never end, it is, of course, guaranteed that it will end at some point. I have an interesting theory about where that point may be. Something that's always fascinated me over the years is the way the price charts often lead the news. I can't tell you how many times I've looked at a chart and projected a strong move would follow, only to have a news announcement hit later that day and seemingly "drive" price right to my targets. So my theory starts with a question: What could possibly slow this wave down? The big question in my mind is whether this is "real" dissention, or simply the flip side of a coin we've seen from this Fed before. For the past several years, when we've been in-between QE programs, the public-relations strategy was clearly to "keep hope alive" for new QE programs. Of course we don't need to talk hope anymore, because now we have QE-Infinity. I wonder if this isn't simply the Fed playing the game of "verbal monetary policy tightening" the way they used to play the same game in reverse, when Bernanke would run around making statements such as, "My finger is on the QE button!" The Fed knows they're playing a dangerous game by pumping this much liquidity into the market. While they're getting the best of both worlds right now (a stock rally and some economic growth, without rampant speculation in commodities), it's a delicate equation, and they cannot afford for it to flip the other direction. If speculators begin driving up commodity prices again, that will raise the costs of doing business and further harm consumers. This would dampen (and possibly crush) the little bit of economic benefit we're currently getting from Bernanke's tireless printing press. So I suspect that at the March 20 press conference, the Fed will put on their Frowny Faces and make another show of heartfelt-moral-conscience-brow-furrowing about QE3, as if they were lying awake at night wracked with guilt and tears. In the end, though, they will "reluctantly" continue it... "for now." But I think they're going to have to keep scaring us along the way, to keep commodity traders from getting too bold and killing their manufactured recovery. Of course, I can't guarantee anything, as this is simply raw speculation -- but when we look at the hourly chart (below), we can see that the week of the FOMC meeting coincides nicely with the wave structure and the potential peak in blue wave 5. 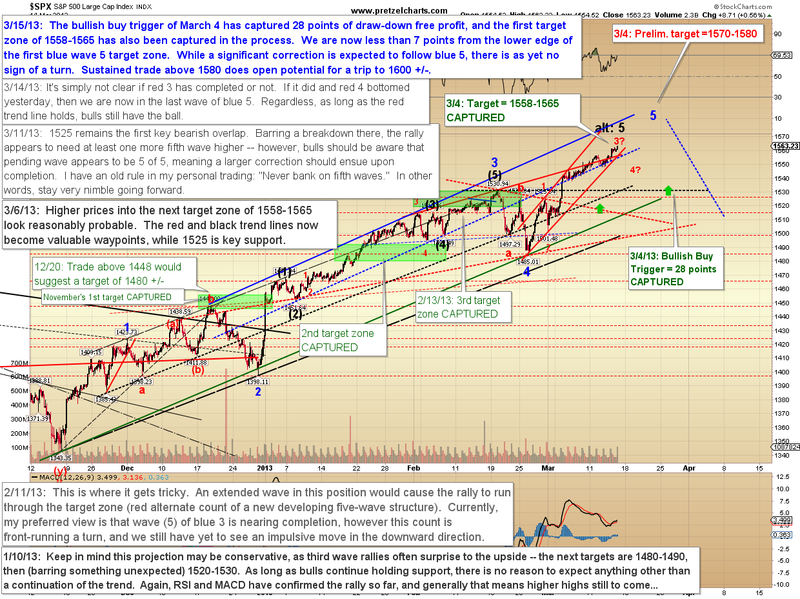 For the past couple weeks, my expectation has been that we are now in the fifth (and final) wave of this particular wave sequence, and yesterday the market reached the first of my target zones for this wave (1558-1565). When targets are reached, it's not necessary that the market reverse immediately (or even that it reverse at all), but it does become a zone of higher probability for a reversal. With that, I must note that this first zone is not the "final" target for the entire wave, but only the target for red wave 3 of blue wave 5 -- the final target is 1570-1580. The market is only a few points away from that zone now, and though it has shown no signs of reversal yet, I would keep a very close watch on this rally heading forward. Note the black alternate count, because there are enough squiggles for wave 5 to be entirely complete. In conclusion, there's no sign of a turn yet, and the trend lines are all intact, which means the trend at every level is still pointed upwards. Ideally, I would still like to see a bit more in the way of higher prices from blue wave 5. Nevertheless, given that the wave structure seems nearly complete, and there is the possibility of more negative jawboning from the Fed next week, it's hard to recommend anything other than a high degree of caution here. I think I'm probably a bit early with these warnings, but I remain on high alert for a pending turn. I should add (for new readers) that at this point, I am not expecting this will be the final end of this central-bank manufactured bull market -- but I am on the lookout for a good scary correction starting in the near future. Trade safe. It's funny how the media made such a big deal about the FED meeting where one member had suggested that they cool the QE program. All the other members including Big Ben poo-pooed the idea and voted to continue QE. I'm really wondering what if anything can cause any kind of market correction. Like I said earlier it seems like this market is hypnotized into buying at any cost. I pulled out my last stakes out of the SP500 at 1550. Something just deosn't seem right about a market that just keeps grinding higher without any kind of pullback. Don't think that we will hear anything different from Big Ben on March 20th, However, the expiration of the US budget is on March 27th. Perhaps the media will write scary headlines about the budget mess and maybe cause a short sell-off. 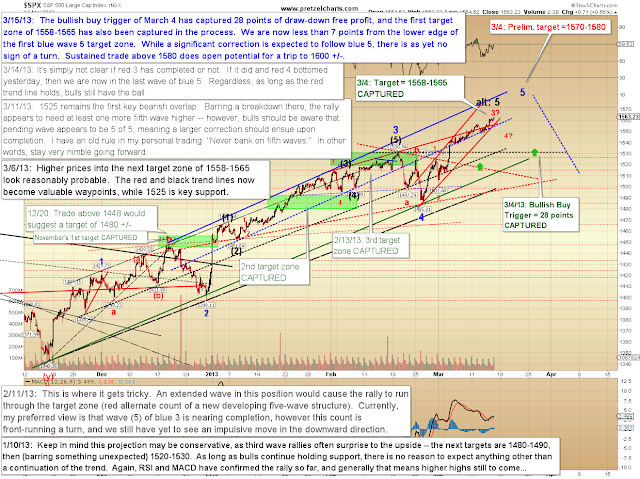 But in the end the budget ceiling will be raised and the market can continue on it's merry ride higher. Vive la QE !!! (said with a sarcastic tone).